East Face of Bugaboo is one of the dominant features in the Applebee cirque. The East Face had (deservedly) garnered a reputation for natural rockfall, this is compounded by human generated rockfall from climbers traversing above on the immensely popular Kain and NE Ridge routes. These factors diminished activity in recent times, despite the walls obvious aesthetic appeal and short approach. Being tucked away on the right side of the face, Divine Intervention is not exposed to the exfoliation zone of the central face, nor is it exposed to the climber generated rockfall from above because the NE ridge route travels on the north side of the ridge crest at this point. 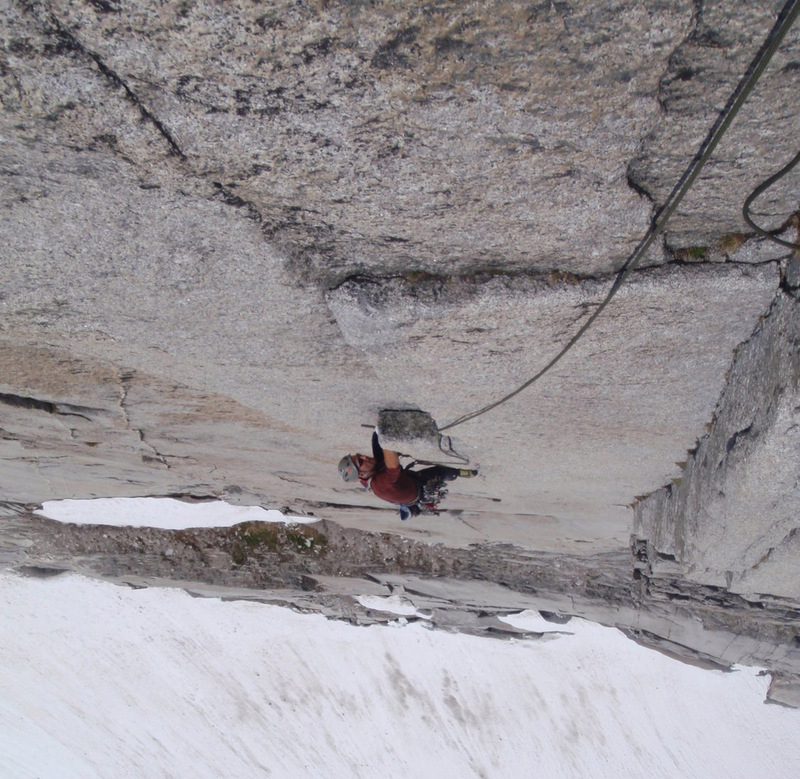 Perfect granite on pitch 4. 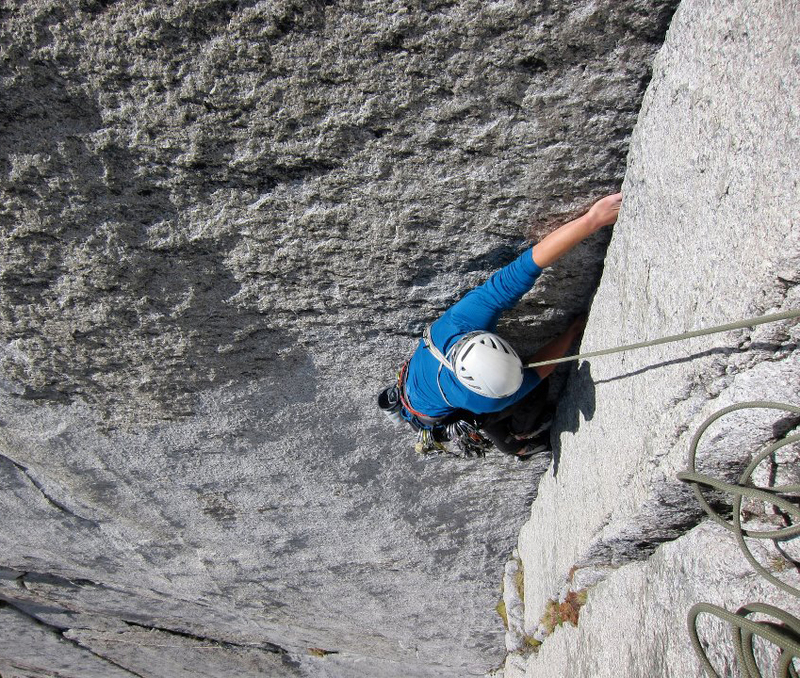 With the exception of the first approach pitches, this route features sustained and mostly clean climbing. The south east aspect of the wall stays in the sun until the late afternoon. The approach from Applebee camp is a very casual 30 minutes.A fixed rappel line has evolved from at least the top of the 5th pitch (maybe higher). The first ascent team endorses the addition of bolts to these anchors by anyone with the motivation. This route is relatively low commitment and would be a reasonable choice for a late start or questionable weather. Starting up the sustained pitch 3. An early start will keep you in the sun all day. If you want to continue to the summit you will want to descend the Kain Route, this means bringing your boots and axe (whatever you need to get down the B.S. col). A better strategy is to leave your boots and packs at the base, forgo the summit and descend the NE ridge. Descending the NE ridge from this point is relatively short and painless with some downclimbing and straightforward rappels. Walking 200m back to the base in rock shoes should be okay with soft afternoon snow and the gentle slope. Two ropes are recommended, especially if you have to rap back down the climb, although the NE ridge could be descended with one rope and some tat. Double set of cams to #3 BD, extra thin finger size cams, nuts, RP’s, lots of runners. 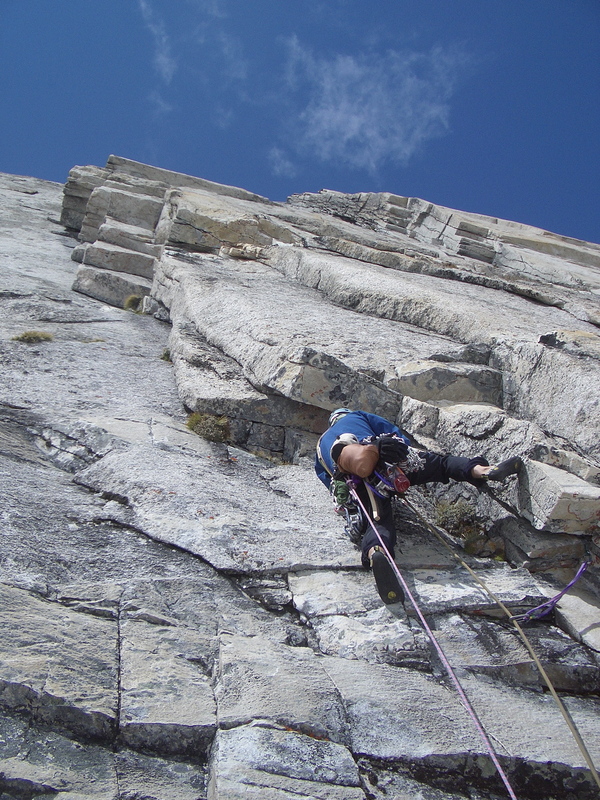 Climb off the Balcony aiming for the first major dihedral left of the Harvey-Roach route, set up belay at a stance in the obvious dyke that traverses the lower right hand side of the face. 5.9. Sustained and aesthetic climbing passing several small roofs the final roof being overcome by grabbing a dubious looking, but solidly planted, jutting flake. Continue up corner to decent belay stance. This pitch is close to 60m. Continue up corner until it is possible to make an intimidating undercling left, this leads to an amazing hidden splitter which which is followed to a comfortable belay ledge. 5.10d. Climb a deceivingly pumpy finger crack up small left facing corner. A committing mantle is followed by thin face climbing which regains the dominant left facing corner system. 5.11b. Follow corner to its terminus on a large ledge. 5.10b. Climb down several meters, move right and up dominant weakness. 5.10a. Continue up broken terrain until it is possible to climb straight up through cruxy headwall gaining the NE ridge. Down climb and rappel the NE ridge. Nearing the end of pitch 3.